The final project for our shoebox gathering was my card. I have a newer set of stamps from Rubbernecker which are 2-3 steps of stamping. This is their poppy water color image. We used a combination of dye based ink pads and water color markers to get the color effect you see. 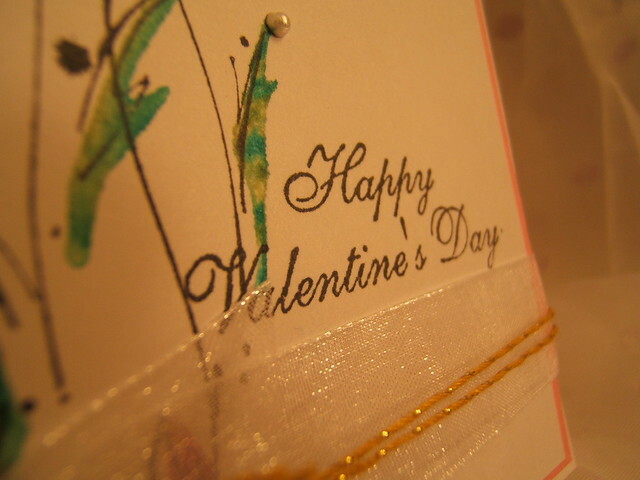 Here you can see that I added a Valentine sentiment and added some organdy ribbon to embellish. I also added a double strand of gold metallic crochet thread. 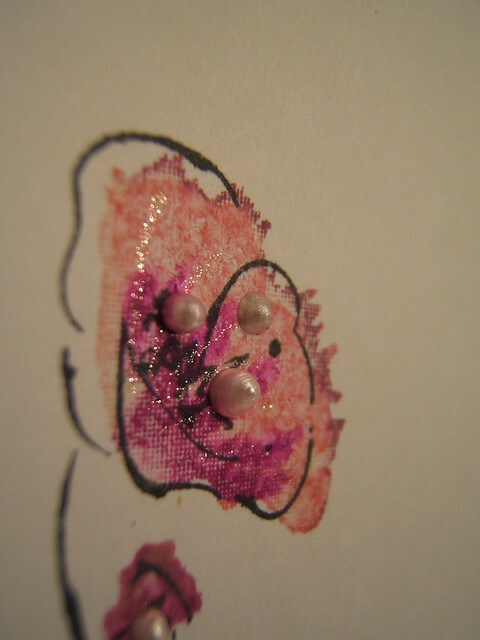 Here you maybe able to see that besides the water color stamping I also added jelly roll glitter pen and liquid pearls. And now the pop up surprise on the inside…heart embossed panels topped with punched lace and dangling holographic hearts! Here is the aerial view so you can see more of the 3-d look of this when opened. 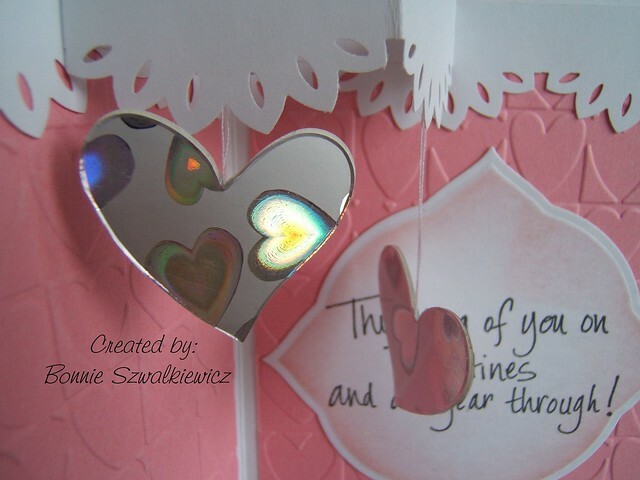 A quick look at the holographic die cut hearts (Sizzix original die), dangling on a piece of plain sewing thread. They twirl in the air currents in the room and are always sparkling. 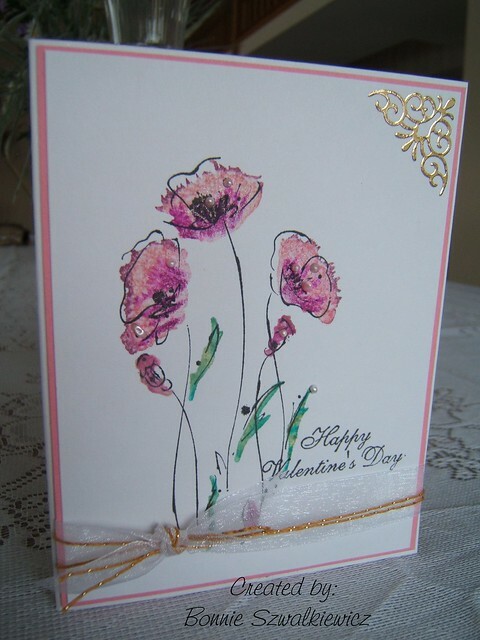 The sentiment in the background is really nice as you can send it to a friend rather than only your sweetie. The sentiment is by Endless Creations. 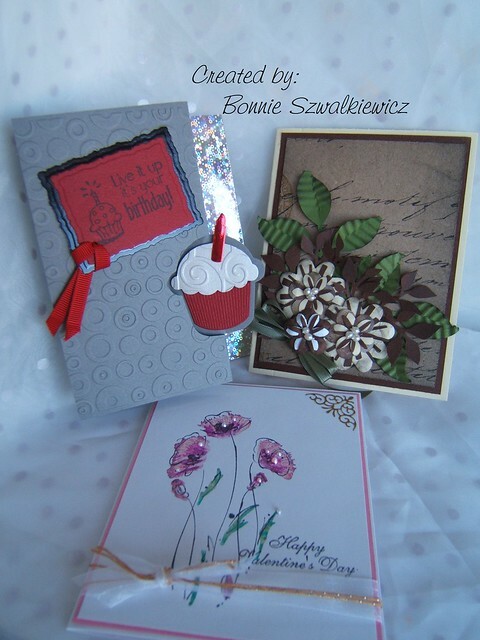 And finally a review of the shoebox cards for January that we made. It was a fun evening however I am sorry to say that my friend Maggi didn’t make it over to the shoebox night because of inclement weather. I sure hope next month will be kinder to us. And an extra note of thanks to Chrissy for hosting the first shoebox of 2014! As soon as I saw that card I was sure I was looking at a Rubbernecker stamp. Love those! 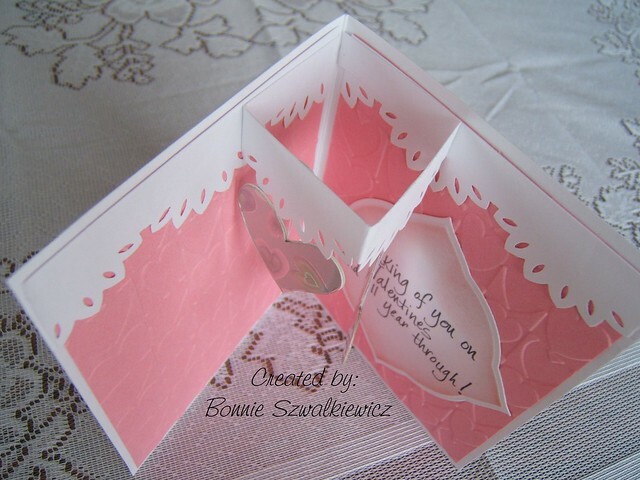 What a fun way to finish off the inside of the card.. Great way to use that punch and add the hanging hearts! love those hanging hearts! And what a great way to do the inside of the card. Thanks for the inspiration.